Did not really sleep much last night. We went out with a few of the guys. Jay and I received simultaneous phone calls at 4 am when we were trying to sleep. That is what happens when both your ladies are on the west coast and they do not understand the time difference, figures...no just kidding. So, ended up sleeping until 12 pm today, Sunday. I room with Jason Garey, let me tell you about him. Jason: I am trying to teach him how to be a real man with our deep political discussions. 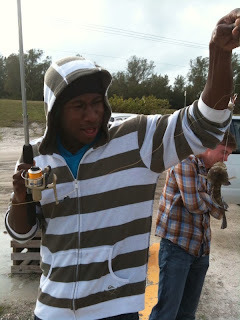 Iro: Haha, I caught my first fish ever with Jay a 35 lb. cod. Jason: Ha more like 3 ounce cod, got lucky. He comes off like a beer drinking redneck who fishes, but there is more to him. He is always reading real estate, get rich quick, and political books. I think he wants to run for a seat in Louisiana next election. Oh yeah, and he walks around naked a lot, a lot...Also, he sleeps naked on top of the covers, kind of creeps me out. As we say in England, he is a weirdo. Came out and laid on the couch and took another little nap. Man, I did notin'. Hangin' out on the computer all day and oh wait, I did one thing productive which was a walk. I put my phone on silent cuz' I did not want to talk to anyone. I kinda wanted some food, but there is nothing around. It was about a 45 minute walk. But, on the way back I stopped at the shop (grocery store) and picked up sometin' healthy, good ole' fried chicken. That is Jay's southern influence. Over the off-season I felt more enlightened, almost wiser. I hear Danny is doing the beard thing, but I am growing out the afro. Maybe soon I will come to practice with a pic in my hair and maybe I can get Lenhart to do some corn rolls with me. I have realized during this time in the off-season that you really have to start looking after your body so much more. I know I have been doing a better job at staying on top of little things. Well, minus my fried chicken, but oh man when it hits your lips it tastes so good mmmmm. First off about my little injury, I think everyone knows when Jed gets tackled how much he screams and yells. Also, Jed goes and slaps a 14 year old in our game against the national team. How is that for a big baby? haha, got ya back Jed. But, two weeks ago on the turf mi back started hurting and then the beep test kind of aggravated it. At this point it is nothing serious at all, but you gotta give it some TLC (touch love and care). So, I will be back in full practice tomorrow, monday. Thanks for all your support. I will leave you with this: I would be shocked if we were not playing for the MLS Cup 2010. Heard it right here. I have to say, this is the best blog ever! You guys just make my day! I hope you get Brunner to write one... only if you can pull him away from Call Of Duty! I think it's funny that you scooped Shawn Mitchell about Andy Iro and the new Striker, are you gunning for his job? Nice post Andy and don't let Jed fool you, he could probably beat up at least a 16 year old(Girl I mean).